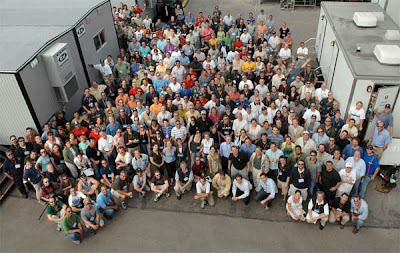 Eye On Sports Media: Photo: How Many People Does CBS Sports Employ at a Super Bowl Game? Photo: How Many People Does CBS Sports Employ at a Super Bowl Game? Broadcasting the Super Bowl is a major undertaking in terms of planning, staffing, logistics, etc. But just how many people does CBS Sports have on site for Super Bowl XLIV? I cannot answer that question for you at the moment, but take a look at this shot of the crew from Super Bowl XLI in Miami and you might get a rough idea. Super Bowl XLI CBS Friday rehearsal. CBS PHOTO by JP Filo ©2007 CBS BROADCASTING INC. ALL RIGHTS RESERVED.